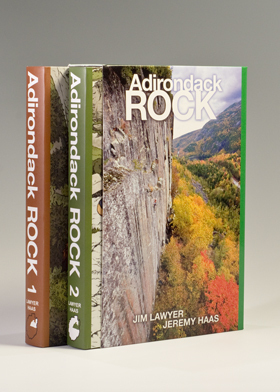 Adirondack Rock is the comprehensive rock climbing guidebook to the Adirondack Park, written by Jim Lawyer and Jeremy Haas. The guidebook includes all technical rock climbing routes from all known crags located on public land within the boundary of the Adirondack Park in New York State. We are proud to introduce the second edition of Adirondack Rock. The guide has been completely revised and updated, and has many new features to help you decipher a vast and complex region. The second edition is available now. Click here to purchase your copy. We sign all books purchased from this web site, and you won't be charged until we ship it. The slipcase shows Monica Wormald on the popular route TR (5.10a) at the Spider's Web. Located in Chapel Pond Pass, this wall is considered by many to be one of the premier crack climbing destinations in the northeast. Poke-O Moonshine is available for your Apple or Android device using the Rakkup app. Forewords by Tad Welch (English) and Loïc Briand (French), and cover illustrations by Colin O'Connor.